Dirtiest Trade Deal (TPP) of 2015 Censoring The Internet, may be the dirtiest trade deal you’ve never heard of. The Trans-Pacific Partnership (TPP) could cost us our internet freedom, labor rights, access to affordable medicine, the safety of our food, and protections that keep our water and air clean. Congress is trying to make sure the public doesn’t have a voice in negotiations around the Trans-Pacific Partnership (TPP). They’re trying to “Fast Track” the secret deal, threatening our Internet and our democracy. 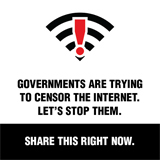 Fight back by joining the Internet Vote on April 23rd. Let’s flood Washington, DC with calls and emails to make it clear how the Internet is voting: against censorship and against Fast Track. Here in december 2012, I encountered some pretty clear UFO story fakes. The first one is about a UFO crash off the coast of Okinawa, Japan, and they use a picture I have seen several months before. This one above is not a UFO, but a lens flare in the camera attached on the Google streetview-car, see video below. Pink UFOs, or more lens flare on Google Street View? Another blatant UFO photo hoax, apparantly started in the province of Sakhon Nakhon, Thailand, makes a story up about a schoolgirl, who takes a picture of a UFO while she is attending a school sports day on December 25th 2012. As you can see in the three images below, which refer to each article above, it´s the same object tilted with the same angle on all three images. Obviously a hoax, made on a smartphone maybe. Someone may have invented the smartphone UFO-app., or simply made this in Photoshop. Please respect the existing legislation of copyright, which means you may download the pictures onto your computer, but not use them on your blog, website, Facebook etc. etc. LIVE STREAMING of the Copenhagen UFO Conference w/ Richard Dolan, Håkan Blomqvist (UFO Sweden), Francisco Mourão Corrêa (Exopolitics Portugal) and Robert Fleischer (Exopolitics Germany). Buy your live streaming tickets here and see it live on your computer!